I know. I should probably keep my blog more literature based, but this is sort of literary. Yes, mes les déments, I still have vampires on the brain. However, not the ones I’ve been talking about for the past week. This time it’s Lestat, one of my favorite vampires. 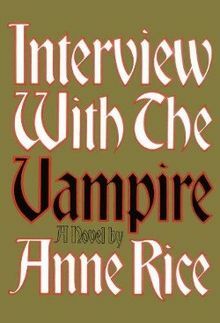 I read Anne Rice’s Interview With A Vampire back in the 90’s, and immediately gobbled up all of the books out at the time. I also got hooked on The Mayfair Witches series with Lasher. But that’s a completely different subject. We’re on vampires today. The only problem I have with Interview With a Vampire was the movie. Ok, don’t hate me. Tom Cruise was a very poor choice for Lestat. There were other actors who were just as talented and fit the role better. I won’t go into my choices because for one thing, it’s been a while and I’ve forgotten most of them. Sting, was one of the names my friends came up with (Dune & The Bride-sigh). I also was not pleased with Armand. Armand is a 14 year old vampire. I love Antonio Banderas, but I would rather have had more authenticity in this role. If they can keep Claudia, a little girl vampire who is all the more frightening for her youth, then they could have kept Armand as he was. Also, Armand is French, not Spanish. Please, could we not have kept that at least? And Louis, well, Brad Pitt had the hair. I’ll leave it at that. As for the scenes, most were okay, though they left out some I would have rather they kept. There were some they put in that I thought superfluous. Overall, a better, more thorough job could have been done. The movie left me with that ‘eh, it was okay’ feeling. I would really like to see this remade. There are so many outstanding actors now: Luke Evans, Zachary Quinto, Jude Law (still) to name a few. It’d be hard to pick exactly who I think would be good in what roles. Although, I would love to see one the Fanning girls as Claudia but they are too old now to play the role I think. And there are several young actors who could play Armand, although I’d really like to see a French Armand. I’d also like it to stay as close as it can to the book. I know there are scenes that don’t work onscreen and, as a writer, I see the unnecessary areas as repetitive. Descriptive details in books are simply there onscreen; we do not need to be told that the table was by the window. I get that. But, it would be nice to see a film like this re-done with more scenes that flow better or were more important to the story line. I am going to have to go dig my books out of storage now and read them again. Hope you are having as great a Thursday as I am, and a wonderful May Day. I know. That’s why I’ve started reading AFTER the movie. That way neither book or movie is ruined for me. I receive the pleasure of seeing the movie as a separate work, and also enjoying the book in its own right.